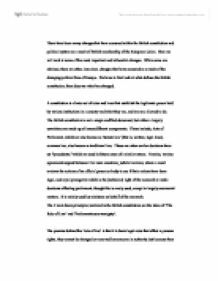 There have been many changes that have occurred within the British constitution and political system as a result of British membership of the European Union. Here we will look at some of the most important and influential changes. While some are obvious, there are other, less clear, changes that have occurred as a result of the changing political face of Europe. 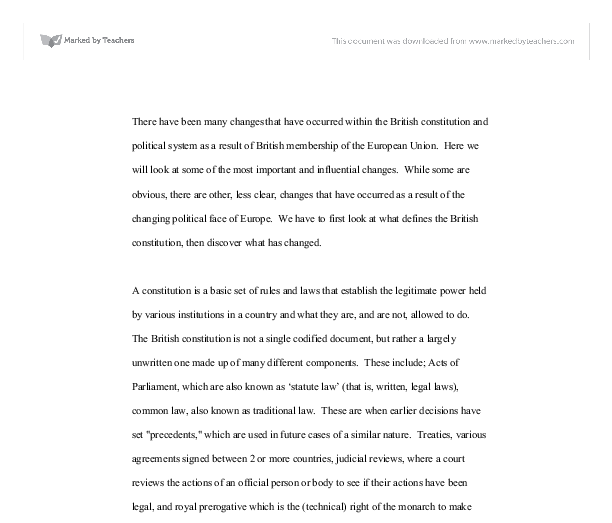 We have to first look at what defines the British constitution, then discover what has changed. A constitution is a basic set of rules and laws that establish the legitimate power held by various institutions in a country and what they are, and are not, allowed to do. The British constitution is not a single codified document, but rather a largely unwritten one made up of many different components. These include; Acts of Parliament, which are also known as 'statute law' (that is, written, legal laws), common law, also known as traditional law. These are when earlier decisions have set "precedents," which are used in future cases of a similar nature. Treaties, various agreements signed between 2 or more countries, judicial reviews, where a court reviews the actions of an official person or body to see if their actions have been legal, and royal prerogative which is the (technical) right of the monarch to make decisions affecting parliament, though this is rarely used, except in largely ceremonial matters. ...read more. The European Court of Justice (ECJ), based in Luxemburg, provides a platform for challenging the decisions of the British courts. This is not only the case in Britain but in all countries in the European Union. The name given to the collections of laws created by the European Community is known as "acquis communautaire", and includes all treaties, rules and directives passed by the European Court of Justice. These laws them become transferred wholesale to new member states joining the EC. This, of course, just creates a whole new level of bureaucracy and difficulties to legal proceedings, (Maastricht and Beyond, Building the European Union). A famous example of this was the 'Factortame' case. This involved a Spanish boat, whose owners claimed that the Merchant Shipping Act (1988), a British law, did not apply to them as it was contrary to European law. The case went all the way to the House of Lords who agreed that the EU law should take priority. This was a very important moment in British politics as, not only had it shown that British laws were secondary to European laws, but that even acts of Parliament could be declared illegal. When the ECJ adopted the 'European Convention for the Protection of Human Rights' this convention therefore became part of the British legal system, with no regard for the wishes of the British legal system, and without going through the regular parliamentary procedures needed to pass a law in the UK. ...read more. if help was needed. (The Political System of the European Union) This was acceptable to Britain as they already had strong links with NATO and especially America. The 'Social chapter' on welfare and the regulations of working hours, was an important part of the Maastricht Treaty and was written with the intention of "promoting social progress and a high level of employment", the promotion of better working conditions, equal pay and the free movement of workers between member countries (The Political System of the European Union). However, Britain (and Denmark) refused to accept it and the rules in it regarding minimal working conditions. (The New British Politics). The social chapter was later partially accepted by the Labour party when they came into power, when they accepted such things as a basic, minimum wage. However they still refused to accept such things as limiting how many hours a week a person was allowed to (or to be made to) work. As we have seen, the ties that bind Britain to the rest of Europe and strong ad far reaching. It would not be possible to discuss the political situation in Britain without discussions of Europe There is still debate about whether Britain should retain some independence, especially in economic, defence and foreign matters, or whether we should be working even more closely with Europe in an attempt to create a stronger, more unified community. Either decision would have an impact on the concept of Parliamentary sovereignty which has prevailed for so long in Britain. ...read more. This has never happened, but in 1999, after an independent report made for the parliament, the commission al resigned, instead of facing a motion to censure, which would have forced them to resign anyway. The European Court of Justice The European court of Justice is the Judicial arm of the E.U. once a year (i.e. a trip to Australia or Mallorca). * Undertake more short trips such as weekend visits to cities, ski areas or to wellness resorts. Lastly, unlike Americans, Europeans are unwilling to take their kids from school during the year for vacations. The Intervention price is the price the EU guarantees farmers will get if they cannot sell their produce on the open market. The EU agrees to buy the surplus. 2. Import Levies are imposed by the EU on food imported from outside the EU so that farmers do not have to deal with tough competition outside the EU. This power of questioning granted citizen would prevent the corrupt practices that had eroded the commission before it reform. Consequently, bring about transparency within the union activities since all it institutions are expected to be accountable to the citizens of the union.